Fimak Group is a leading supplier of Personalised Plastic Cards, Smart Card Integration and Managed services in Ireland and the UK. Its subsidiary, Credit Card Systems Ireland (CCS), counts leading banks and financial services companies among its customers, as well as government and educational bodies. 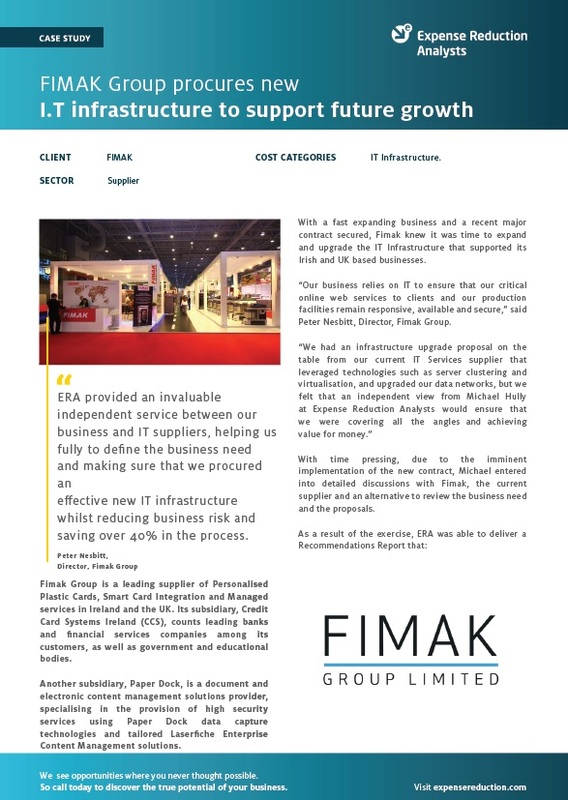 With a fast expanding business and a recent major contract secured, Fimak knew it was time to expand and upgrade the IT Infrastructure that supported its Irish and UK based businesses. To find out more about how ERA helped FIMAK Group, including results, savings and more details from the client, download the full case study now. To find out more about how ERA can help your organisation, get in touch.